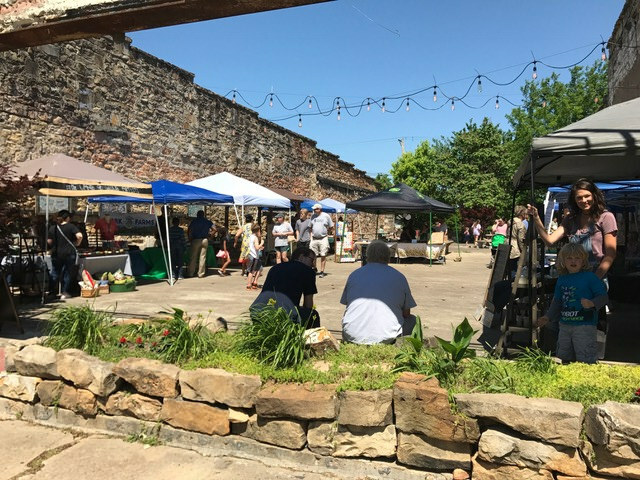 The Main Street Batesville Farmers Market will open for the season on Saturday, May 4. The market will be open from 8am until noon. Admission is free. There will be kids’ activities, live music, local produce, artisans & crafters, and more. Interested in having a booth? Booth spaces are $10 each day or $90 for the entire season (if paid up front). Vendors who pay for the season are also eligible to set up at the Southern Food Festival. The Farmers Market will be open the 1st and 3rd Saturdays of each month, May thru September. On Star Wars Day (May 4th) Main Street Batesville & Citizens Bank will team up to bring Star Wars: The Force Awakens to the Pocket Park in downtown Batesville. Admission is free. Festivities will begin at 6 p.m. and downtown restaurants will have booths setup with food available for purchase. Sponsors include: Peco Foods, Citizens Bank, FutureFuel, Autry's White River Furniture, Bank of Cave City, Southern Bank, Centennial Bank, and Fringe Salon. The Lockhouse Orchestra will be performing a Beatles tribute concert on Saturday, March 23 at 7:30 p.m. at the historic Melba Theater. Tickets are $20 and available online and at Merchants and Planters Bank in Batesville. Merchants and Planters Bank is the presenting sponsor of the concert. Proceeds benefit Main Street Batesville and the Maxfield Park project in downtown Batesville. On Monday, March 11 from 10am until 12pm, Arkansas Small Business Technology Development Center will be presenting a workshop titled "Social Media Success Strategies". The workshop will be geared towards small businesses and their online social media presence. Registration is free but you must preregister. This event is sponsored by Main Street Batesville - Arkansas and FNBC. The 2019 Winter Gala will be held Friday, February 1 at 6:30 p.m. in the Main Street Loft at 267 East Main. The theme this year will be “Footloose”. Attendees are encouraged to wear their favorite dancing boots and dress accordingly to the era. Individual tickets are $35 and couples are $60. The evening will feature dancing, live music, food, drinks, live & silent auction, contests, and more. You can purchase tickets online here. The 2019 Winter Gala is a fundraiser for Main Street Batesville. Main Street Batesville will be hosting “Rocky Horror Picture Show New Years Eve Celebration” at the Main Street Loft, located on the 3rd Floor at 267 East Main Street. The event will begin at 8 p.m. and tickets are $15. Tickets can be purchased at HERE or at the event. The evening will feature dancing, a DJ, an interactive movie experience, refreshments, drinks, and more. Guests are encouraged to dress in costume accordingly. SpanishGypsy Boutique, Main Attire Batesville, and Sweetie Cakes are hosting the second "Ladies Shopping Night" on Thursday, December 13th from 5pm - 9pm Come and shop downtown in the evening for a new experience! The inaugural “Ladies Shopping Night” was a huge success. Laura McGuire of Main Attire said, “We had people in the store until 9:45 p.m. and had tons of shoppers”. Natural State Running and Spanish Gypsy Boutique both reported increased sales and foot traffic, too. The Styling Room and Sweeney’s Men’s Grooming are teaming together to have an event featuring FREE haircuts! One of the best ways for someone to feel refreshed and new again is a trip to the stylist. The event will take place on Saturday, December 8th from 10 a.m. until 2 p.m.
Help yourself or a friend out and let them know about this opportunity, thanks to 2 great downtown businesses. A judging number will be assigned to your float. Line-up at Town Plaza Shopping Center will begin at 4 p.m.
1st, 2nd, and 3rd place parade float winners will be announced Tuesday, December 11, 2018. Categories to be judged are: Commercial & Non-Profit/Civic organization. All winners will be notified. All entries must be decorated with holiday spirit and lights. Santa will be in attendance on the Kiwanis Float at the end of the parade. The reindeer will be flying Santa Hershel in for a meet & greet before he gets too busy making toys! He will be available for pictures from 1pm until 3pm at Fellowship Bible Church on Saturday, November 24th. A photographer will be on hand taking photos but feel free to use your own device, too! Support & shop local on "Small Business Saturday". Join us on Saturday, November 24th as we celebrate the heartbeat of our downtown - the merchants. Stores will have sales/promotions throughout the day and there will be other events taking place downtown. Head to downtown Batesville, AR for one of the most wonderful times of the year! During Holiday Open House you can get ahead of the hustle and bustle of December shopping and actually enjoy your experience! Be sure to stroll Main Street Batesville and beyond. You can snag Christmas gifts that are as original and independent as Batesville itself. We are lucky to have plenty of unique shops on Main Street Batesville for clothing, art, music and much more. Downtown is the perfect place to find some one-of-a-kind gifts, holiday decor, delicious specials at restaurants and you can enter special drawings throughout the weekend. •Clara Jane & Jax - Special pricing on select items. Customers can also enter to win a gift card and can draw for their discount on regular priced items. •Spanish Gypsy Boutique - Lots of sales and when you make a purchase, you will be entered to win a GIFT CARD! •The Pinto Coffee & Comida - Drink specials all day! They will be launching their new fall/winter drink menu! Spooky fun awaits you at this year’s Main Street Batesville “Fun and Safe Halloween,” Wednesday, October 30 from 5-7 pm. The public is invited to stroll the vibrant residential and business areas of Main Street as residents and merchants pass out candy and treat you to the friendliest street in town! Enjoy this fun and free community activity in safety; side streets will be blocked off, allowing little ones to meander in safety. Children are encouraged to wear costumes and make some memories! This Halloween, Main Street Batesville wants your blood. The Arkansas Blood Institute will be parked at The Darkness: A Haunted House from 2pm until 6pm on Tuesday, October 30. The haunted house is located at 570 Stadium Drive in Batesville, Ark. Donors will receive a free shirt and admission into the haunted house. Donors are required to bring a photo identification. To schedule an appointment, visit www.arkbi.org. The 2018 Farm to Table Dinner will be held at the Barnett Farm located at 75 Bar Bell Lane in Batesville, AR. This year’s event will feature well-farmed & well-prepared local foods. Cocktails & hors d’oeurves will be served at 6 p.m. and dinner will begin at 7 p.m. Tickets are $65 each and a table of 8 is $500. This year’s presenting sponsor is Merchants & Planters Bank. To purchase individual tickets, click here. To purchase a table for your group, click here. Your favorite three witches will be on the outdoor movie screen at the Pocket Park on October 12. Festivities will commence at 6 p.m. & the movie will start around 7 p.m. Admission is free. The masterminds and fear experts at Batesville’s The Darkness are working overtime to give you the scare of a lifetime! The Darkness exists within the cavernous, winding rooms of an old industrial complex at 570 Stadium Drive, on the dark banks of the White River. Doors will open at 7 pm on October 5, revealing a legion of the dangerous, the demented, and the downright terrifying! Just minutes from Main Street, The Darkness is making this year the best ever, with new ideas, new gear, and new ways to keep you up at night! In addition to scaring your socks off, MSB Director Suzanne Magouyrk promises new features such as a friendly Lights On Tour and Media night, a VIP pass program, the Monster Mash Dance Party, and some frightening public appearances before this scare season’s big opening night. Tickets are $10 each, and discount tokens will be available at Southside and Batesville football games on Sept 14 and 21. The Darkness is a fundraiser for Main Street Batesville and is co-chaired by David Thompson and Suzanne Magouyrk. Merchants and Planters Bank is the presenting sponsor. The Darkness is also available for private events! Need an eerie and unforgettable experience? Reserve your private booking now! For more information, visit The Darkness: a haunted house by Main Street Batesville Facebook page or go to www.mainstreetbatesville.org. Unique Nosh will be hosting a "Froyo Fundraiser Night" for Main Street Batesville on September 18 from 4 p.m. until 7 p.m. During this time, 10% of all sales will go to the Main Street Batesville organization. Batesville will once again be a host city for the annual IBLA World Tour, a prestigious group of classical musicians, singers and composers who each secured their place on their tour by means of an international competition head annually in Italy. The group will perform a free concert to the public at 6 p.m. May 2 at Brown Chapel, Lyon College. For the third year, the City of Batesville has partnered with Citizens Bank and First Community Bank to bring the rare concert opportunity to the community. The stop in Batesville comes courtesy of Sherman Banks, an Arkansas native and vice president of the IBLA Foundation, who has worked with Mayor Rick Elumbaugh to add the Arkansas concert location. “IBLA offers Arkansas audiences the unique opportunity to hear remarkable and recognized world-class international jazz and classic pianists, singers, accordionists, trombone, and percussionists from Georgia, Italy, Poland, Japan, and the USA,” said Banks, IBLA Foundation VP and Jurist. IBLA World Tour group changes each year, per the results of a qualifying competition called the IBLA Grand Prize. Musicians from around the globe compete in the internationally recognized festival held in Ragusa-Ibla, Italy – a United Nations Heritage Site for which the competition and touring group is named. This year’s winning performers hale from Japan, Georgia, Italy, Maldova, China, Finland. The group will go on to perform on a world tour in such prestigious venues as Lincoln Center and Carnegie Hall in New York, The Tokyo Opera City Hall, and Tchaikovsky Bolshoi Hall in Moscow and in other prestigious venues in Canada, Europe, Russia and the United States. The Annual Bob & Gerry Carius concert series will be held on April 7 at the historic Melba Theater in Batesville, AR. Headliner and ticket information will be released soon. It's the Grand Opening of Maxfield Park and the Grand RE-Opening of Main Street! Farmers Market season is here! Join us for opening day! Don't miss a night of James Taylor and Carole King favorites in this tribute concert held at the historic Melba Theater.